In 2016-2017 Lars Nørgård created the world’s largest colour lithograph in cooperation with Christian Bramsen at Atelier Clot, Bramsen & Georges in Paris. This book documents the work from A to Z. However there wouldn’t be any reason for publishing the lithograph, even less an entire book about its creation process, if it wasn’t a masterful lithograph. It captures all of the rich materiality, which characterizes Lars Nørgård’s abstract-expressive paintings of the recent years. Therefore this is a double triumph. For the workshop as well as for Lars Nørgård. This is how it all started: When Christian Bramsen and his business partner at Atelier Clot, Bramsen & Brunholt, Morten Brunholt, had seen Lars Nørgård’s exhibition Morphine at Horsens Kunstmuseum, in May 2016, they were so enthusiastic that they contacted the artist directly from the museum. The next day the three parties met at a burger bar at Østerbro in Copenhagen. On that occasion Christian Bramsen took some very small lithographic stones from his bag. He uses these stones as his business cards. He placed them closely together on the table, so that they formed a larger rectangle. “Could you imagine that we do something like this, only with real lithographic stones, in a format which only considers the space available in the workshop, after clearing the whole floor space? I mean a lithograph with the dimensions 2 m by 3 m. I’ve been wanting to do so for many years, and when I saw your large paintings at Horsens Kunstmuseum, I knew at once that you are the one to master this comprehensive and demanding process,” Lars Nørgaard tells the author of this article, as we meet in his workshop in Hellerup at the beginning of May 2017. Lars Nørgaard was both tempted and flattered by this invitation, so Christian Bramsen and Morten Brunholt did not need to persuade him. Lars Nørgaard was convinced immediately. In addition they could inform him that the world had never seen such a large lithographic colour print. The lithograph was to be made on stones which previously had been used by the old masters. The lithographic workshop, which was founded 1896 by Auguste Clot, was from the beginning known as the finest art printer in Paris. Here the young “Nabis”- artists had their lithographs printed – among others Vuillard og Bonnard – but also Degas, Munch, Cézanne, Sisley, Rodin, Matisse, and later Asger Jorn, Alechinsky, Bjørn Nørgaard and others. These are the stones on which Lars Nørgaard has printed his large lithograph. However before we get started we owe the reader an explanation of how to make a lithograph. It is also called a stone drawing or stone print (lithos is Greek for stone), the print plate is a special level polished type of limestone. The best stones are the so- called Solnhofer stones, which come from the area Franconia in Bavaria. They are also called Jura marble, as they were created in the Jurassic period. Lithography means that the print plate is in one level as opposed to photogravure or relief printing. The principle is that grease repels water and vice versa. The relation between grease and water is used to separate areas on the stones, where they can absorb greasy ink and other areas, where they cannot, because they have been saturated with water. The artist draws directly on the stone. The lithographic method was invented more than 200 years ago. Making a lithograph – as opposed to for instance a painting – is irreversible, so you need to have a previous plan, before you start. What has been set cannot be changed, no covering white is used as a lifeline. Naturally additions to a lithograph built up like this, require the artist to work on entire areas, since the coloured surfaces usually overlap more than one stone. It can take most of a week’s work to make changes to the motive. Another difficulty, which Lars Nørgaard however is used to handling due to his comprehensive experience with the lithographic media, is the fact that the motive must be drawn laterally reversed on the stone, in other words the artist must keep in mind that the composition is balanced. For this purpose a mirror can be used. No less than 12 of these Solnhofer natural stones were required in order to create this large lithograph, which however is hanging completely together as one joint piece of work with one motive. Lars Nørgaard has spent 300 hours at Atelier Clot, Bramsen & Brunholt, distributed on six visits of 5 days with 10 hours of work every day. In addition to this Christian Bramsen and the people at the workshop, has spent about 1700 working hours on polishing and preparation of the stones, plus preparatory work in the workshop and printing. At every single new visit Lars Nørgaard brought detailed sketches from home, and he also drew a lot of sketches in the workshop in order to manage the composition. In addition from time to time he has made so-called pause drawings, which together with the finished drawings have been printed in this book. attention within the trade and goodwill from the foundations. Seeking financial support was an evident prerequisite in order to carry out the immensely time- consuming and resource-demanding work: Then it helps that it is the world’s largest colour lithograph, which will not only make new art history, but which also due to its size can be included in the Guiness Book of World Records. Furthermore that the lithograph has been created using the stones of the older masters. A third breakthrough invention is the “framing”. All the way throughout art history it has been necessary to have graphical artwork framed and glazed in order to protect it. This fact has contributed to deprive them of the immediacy and tactility that characterizes for instance paintings, which can be seen without distracting reflexes and the distancing “filter” which the glass constitutes. Instead the workshop have mounted the large lithograph to canvas and have lacquered it, so that plexiglass can be avoided. Glass is totally out of the question. It is far too heavy and unhandy, when the format is that large. Anyone who has had the pleasure of visiting Atelier Clot, Bramsen & Georges workshop at Rue Vieille du Temple in Paris, has experienced the vivid setting and the warm atmosphere, which prevails in the old workshop. Every day a hot meal and a couple of glasses of wine are served, and the workshop take a necessary break, during which they socialize with the visitors who stop by. To Lars Nørgaard as well as to all the workshop’s other artists, these breaks are invigorating. In Lars Nørgaard’s paintings of recent years you can find thousands of fantastic “figures”, even though they really are non-representational or non-figurative. The paintings of recent years are a synthesis of all his artistic endeavour from the expressive and slightly ironic mode of expression in the 80s to the more cartoonlike and figurative in the 90s – and latest the abstract-expressive, which is linked to American postwar period painting. Lars Nørgaard is educated at the Academy of Art College in San Francisco, and his painting is rooted in the abstract-expressive American art. Today his art holds a stronger position than ever. 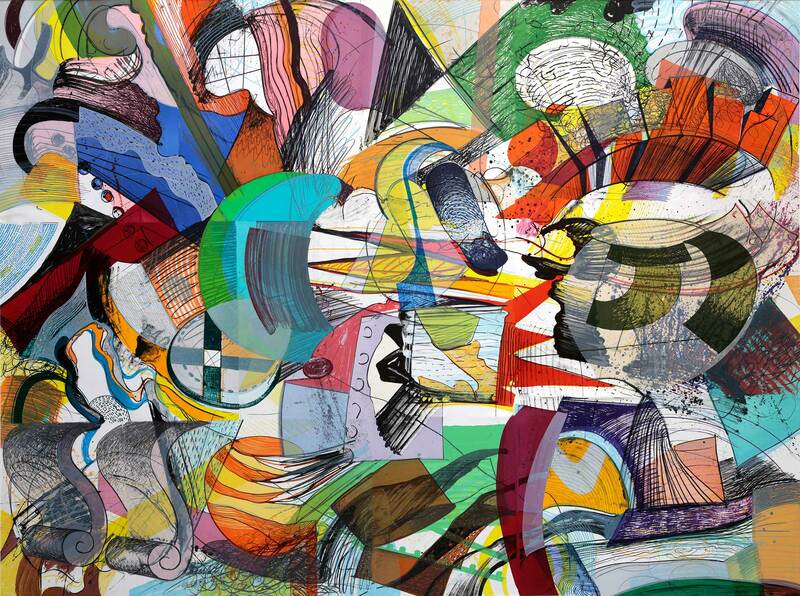 All of the above-mentioned style features appear in his new, 200 x 270 cm large lithograph. The world’s largest to date. However it can also be acquired in 12 smaller pieces, as every single one of the 12 lithographs contain a motive which is balanced and can stand alone without the 11 others. So if you do not exactly have enough space for the large lithograph, you can also buy a lithograph of “normal” size, which is probably a bit easier to hang above the sofa. the experience from the work on the stones is part of an inspirationally fruitful food chain, where one category leaves a new trace, inspired by the other. It has been a “perfect jam session” between Christian Bramsen, who has run the workshop since 1988, and the printer, Thomas Marin, in addition to the “eternally hard-working assistant”, Priscille Arai, and Lars Nørgaard, the latter tells.